I am starting a Sasquatch 16-33. I bought the plans about the time Mick finished his, but never built it. I was in Arizona at the time, but have since retired from the National Park Service, and we moved to Norfork lake in north Arkansas. 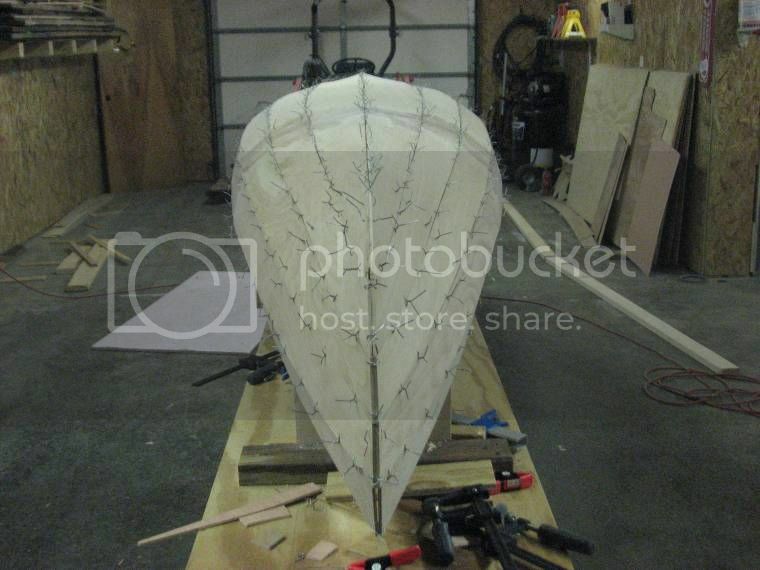 This will be my fourth stitch and glue boat. I built a Swamp Girl and two electric boats in Arizona. I was building in the garage there, but at least I have a heated shop now. My wife and I have fished for many years, but mostly from bass boats. We want something reasonably light weight but large enough to carry two of us on day floats. We are in easy driving distance of the White and Buffalo rivers. The Sasquatch seems to be just about right for what we want. 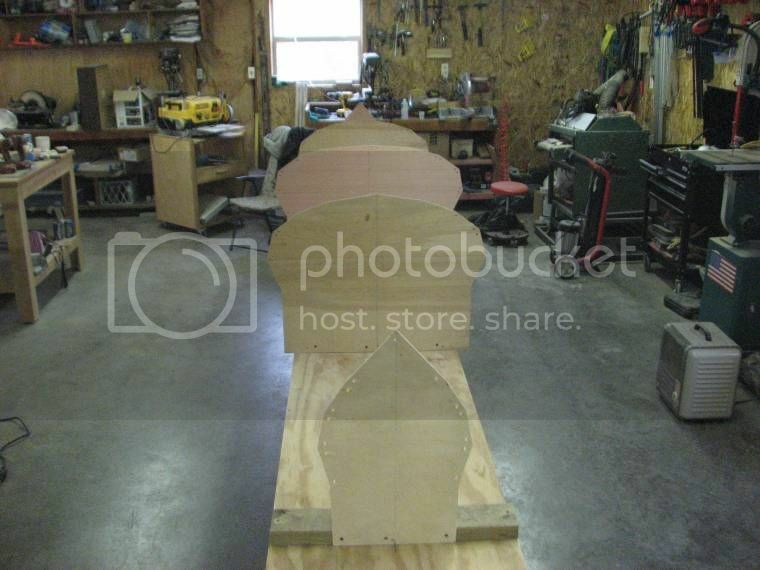 This canoe has ten panels with three sections for each panel. I cut one template of each piece needed (from old plywood) and used it to mark each piece. This way I was able to try to match the grain and color of each piece. 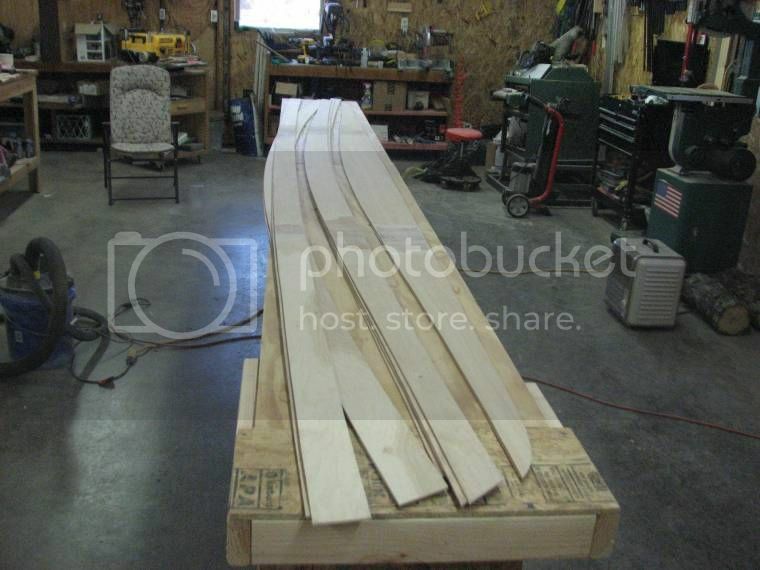 I was able to cut all thirty pieces from three sheets of plywood. 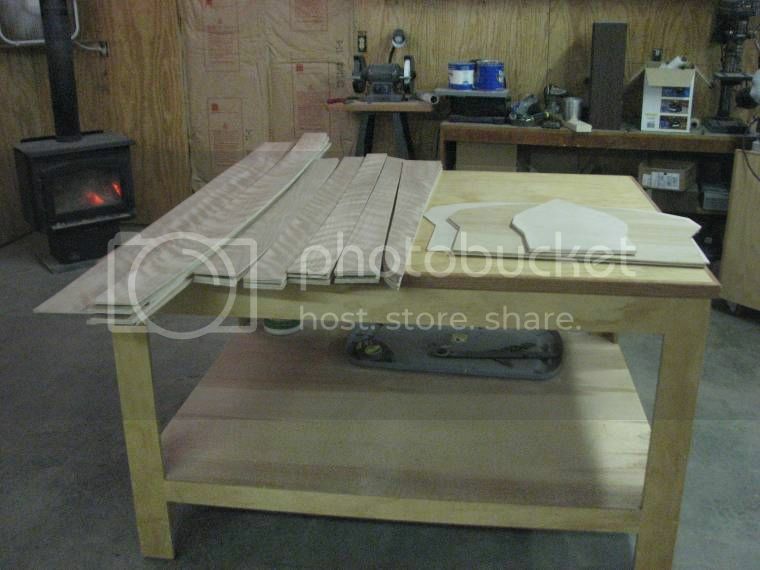 I used the router table to trim each piece to match the template. That's quicker and easier than trying to cut and sand each piece to the line. All thirty pieces cut and ready to assemble. 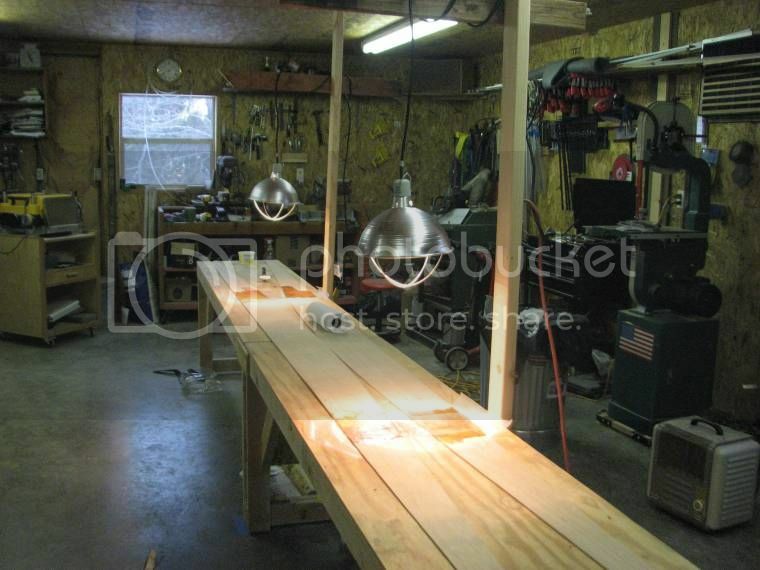 It has been pretty cold here, so I used two 250 watt heat lamps to help the epoxy set up. I did not want to have to keep the whole shop warm 24 hour a day just to let glue set up. I'd run out of firewood if I tried that! Finally! all panels glued up and ready to assemble. It took a week to get them all glued up. I hope to start assembling them tomorrow. You are going to LOVE this boat. Your shop looks well set out and even better appointed. Take your time on this one mate. The end result will surprise you. This is in my humble opinion, the best stitch and glue canoe design of its type, on the market today. I am so very excited that another Sas is on the way. Thanks Mick. I followed your build log closely when you built yours and read it through again before I started. I bought these plans about the time you finished yours, so I have had them awhile. I finally have the place to work and plenty of time since I retired. I wanted something I can carry on the rack of my truck when we pull our travel trailer. I wanted something big enough for both of us to fish from, but light enough to load and unload easily. I am really glad to hear you are still happy with yours after several years of use. It's easy to be proud of a boat when it is new, but it means something when you are still happy with it after extended use. I got a little more done. I used Mick's method of mounting the temporary frames on the work bench. 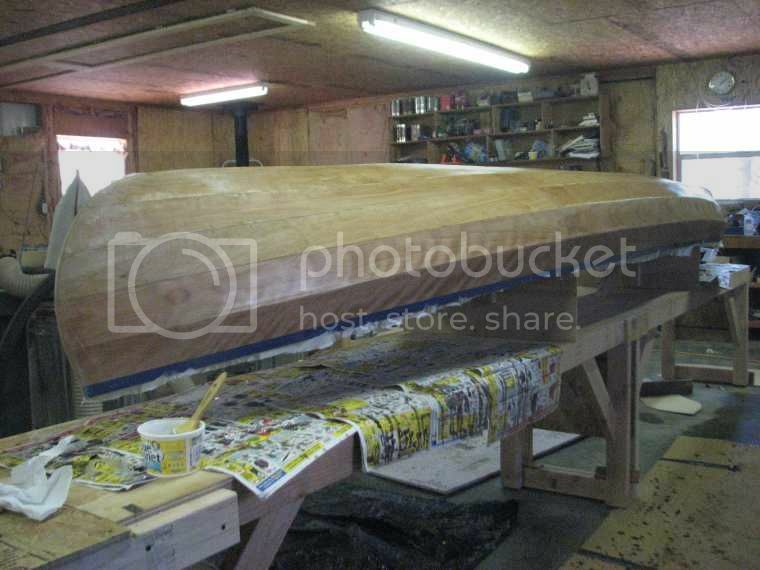 The panels on this canoe are long and floppy and hard to handle by myself. First three panels on each side. Mick is telling it straight about the Sasquatch. I have had a lot of canoes in my life time ( 70 Years ) and started paddling one for my Dad so he could fish and I could learn all the strokes that goes with a canoe. He told me that is the best way to learn and I was bugging him to let me use the canoe. Somehow I think he got the better deal but I did learn how to paddle a canoe before I was riding a bicycle. I never regretted paddling him around the lakes fishing or duck hunting , have some good memories of those times and all the different canoes we had. The reason I got so long winded is simple , The Sasquatch 14 , I have I would not trade , sell or give to anyone , they can fight over it when I die and til then it is mine. The Sasquatch is the finest and lightest ( 30 pounds ) canoe I have been in and plan on being in it for a long time. If you like yours just a percentage of the amount I like mine you will be a very happy paddler. I finally have the place to work and plenty of time since I retired. I am really glad to hear you are still happy with yours after several years of use. It's easy to be proud of a boat when it is new, but it means something when you are still happy with it after extended use. Absolutely true mate. Sasquatch 16.5 X 33 is by far, the best, most versatile boat I own. I fish from her all the time. 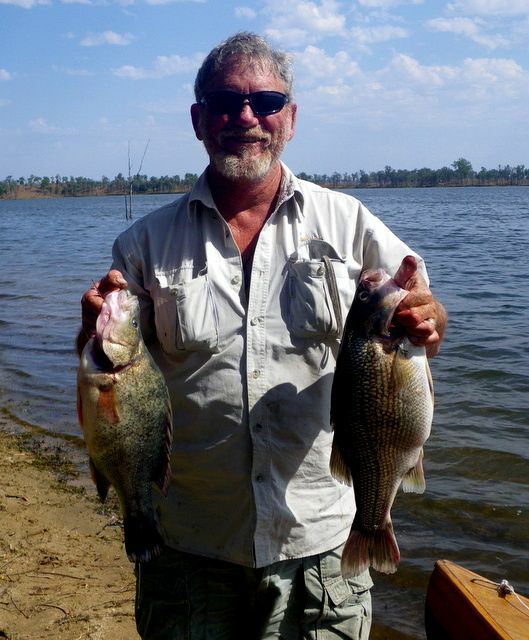 A nice Aussie bass and a yellowbelly I caught from her on a recent trip. I also followed your build closely. Your Sasquatch is truly a work of art. The weight of 30 lbs is also impressive. That setup is what I had in mind for carrying a canoe. That is a great looking rig. I do not recognize the truck, but it has been a while since I was looking at new trucks. 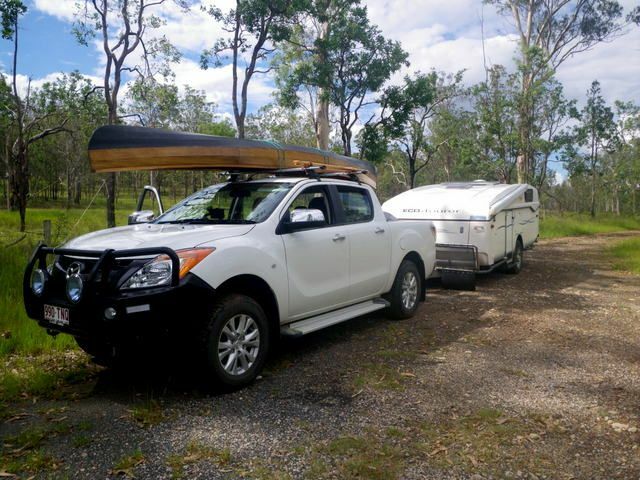 The truck is a Mazda BT50, Identical mechanically to a Ford Ranger only with a prettier body. Mick, thanks for the link. That looks like a truck I would like to have. Unfortunately, it is another interesting diesel vehicle that is not available to us here. I finally got a little bit done today. 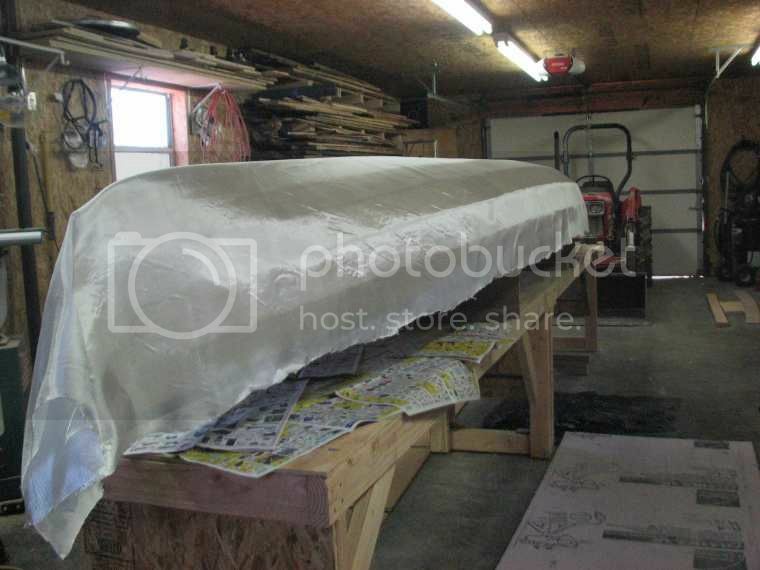 It has been unusually cold here this winter, and it has been a problem keeping the shop warm enough to use epoxy. 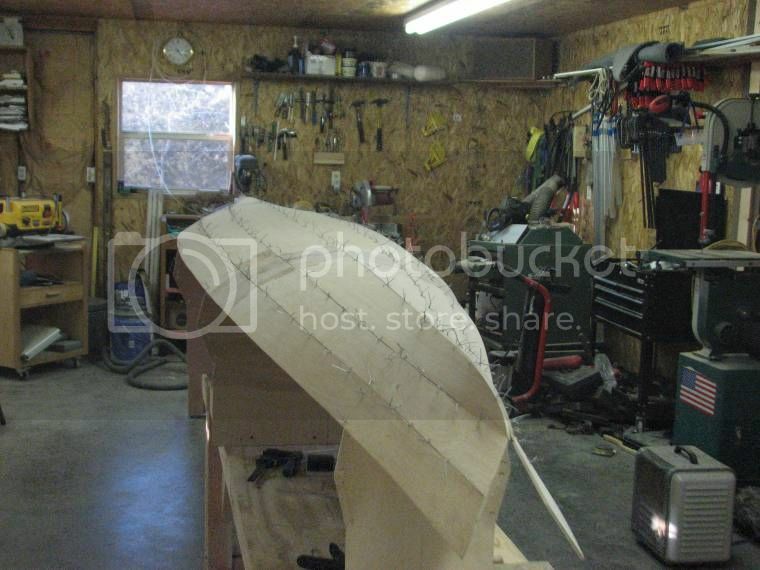 The boats I have built in the past were in Arizona, and I was usually fighting the extreme heat. I bought slow hardener out of habit, I guess. I probably should have ordered at least some fast hardener. All glued up, sanded, and cloth cut. With the temperatures we have been having here, I will probably only be able to get one filler coat on per day. There are 3 special stages with these builds: stitching (boat takes shape), wet out and launch. This one's looking especially good. Bet you want to go down to the shed and stare at it all the time . It's looking really good , don't hurry the process , take your time and before you know it you will be paddling it.